For an eye-catching change from the same old black AR look, any custom JP rifle is available in custom color Cerakote, color-change prismatics or eye-catching Gun Candy. Click the gallery at right to see some of our best custom projects. Receivers and hand guards are run simultaneously to ensure color match. We run all custom coatings made-to-order, so allow a minimum of four additional weeks for production times on rifles or assemblies. Pricing is dependent upon the parts being run. Our standard Cerakote color offerings are Magpul Dark Earth, Magpul OD Green, Tungsten (Dark Gray) and Burnt Bronze, but we can also run specialty jobs in other standard Cerakote colors as well as distinctive camo patterns. The currently available list of non-standard colors is below, but feel free to contact us about any colors not listed here. As with any color process, there can be some slight color variation from batch to batch with Cerakote. In most cases, this is very minimal, but this is why we only run parts in sets and do not rely on combining pieces from various batches to make sets. We cannot guarantee that Cerakote parts purchased from us at different times will necessarily match each other perfectly. To learn more about Cerakote and view their wide range of testing data, visit the manufacturer's website here. A wild experiment for a one-off rifle, these color-change prismatic colors proved a great success. As actual automotive paints, these colors result in a vibrant, high-quality appearance that shifts dramatically depending on the viewer's angle. This effect is only more pronounced in natural sunlight. Our current prismatic color offerings are color-change copper/green and purple/blue. The newest addition to our finishes lineup, Gun Candy is a Cerakote additive that includes a wide range of color option with a metallic glint. Yet, this highly aesthetic finish retains all the durability of Cerakote for a perfect blend of looks and function. The Gun Candy solid color line goes from the glinty black Carbon to the audacious neon green Surge. Many of the solid colors achieve an appearance simiar to decorative anodizing over a glass bead finish. Gun Candy is also available in several chameleon colors, such as Stingray, which shifts from magenta to purple to blue to teal to green. All Gun Candy colors are presently available, so check out our gallery below. You can see more examples of the various colors on the Gun Candy website. Our Presentation Grade Finish is the signature JP treatment and unlike anything else out there. To achieve this distinctive look, we start with a hand-selected billet upper and lower combination that has been hard coat anodized. We then wet sand receivers by hand on a large granite inspection block with increasingly fine grits until the aluminum achieves a refined brushed finish on the proud surfaces. To match the receivers, the barrel also receives a pristine polish and compensator blend above and beyond our standard barrel finishing. Lastly, the PGF look is accented with a grind and polish on the flat of the hand guard nut as well as on the faces of the hand guard attachment screws. The end result is a work of art—a rifle that simply demands admiration. The Presentation Grade Finish upgrade price is $700 for small-frame rifles or $800 for large-frame rifles and is available only on our billet receiver sets: SCR-11, CTR-02 and LRP-07. If you're looking for more than just the black anodize contrast, the PGF is also available on rifles with run in standard Cerakote colors. Because of the efforts involved, allow for a minimum of four additional weeks beyond our standard production times. As the finishing touch to any JP build or lower receiver, we offer a number of lasermark designs that can be added to the magazine well of your rifle. We've picked out several popular options viewable in the gallery below, including licensed art from Larry Correia's Monster Hunter book series. Each of these lasermarks, viewable in the gallery below, is available at the upgrade price of $25. Marking with your personal art or logo on any JP receiver is also available. Base price for this is $50, but additional art generation charges may apply depending on the nature and quality of the submitted file. For orders of ten or more rifles, each one can be marked with a personalized logo, image or text that you provide all at no additional cost. A suitable binary image (black and white with no grayscale) is required, and more complicated designs or unworkable art may incur an art generation upcharge. See our Custom Lasermark Design Guide for specifics. For any custom lasermarks, we assume that you have the legal usage of the art or text submitted. JP Enterprises assumes no responsibility or liability for improper usage or copyright infringement. These rest with you, the customer. Additionally, we reserve the right to refuse any lasermark project if we find the content objectionable and/or unworthy of being associated with the JP name. U.S. Flag Old Glory herself, the U.S. flag makes for a great, simple show of patriotism. Reverse side flag used on right side marking. Skull and Crossbones - The Jolly Roger is a classic pirate badge. Psalm 23 - This is a popular psalm with many military and law enforcement professionals. Never Stray from the Way - Taken from The Dokkōdō, this is the final precept from the great Ronin Samurai, Miyamoto Musashi's ascetic warrior's way. Luke 22-36 - This is a popular gospel verse among 2nd Amendment supporters. Dont Tread on Me - Celebrate your patriotism with this American classic. Join or Die - This is a classic political cartoon by Benjamin Franklin. It signifies our might in unity. Come and Take it - This is a Texas take on the Greek original. It was painted on a flag at the Battle of Gonzales in 1835. Monster Hunter International - This team logo is worn by the elite monster hunters in Larry Correia's best-selling Monster Hunter International book series. Monster Control Bureau - The seal of the federal government's anti-monster division in Larry Correia's Monster Hunter International book series. Task Force Dagger - We match the price of this special mark for a combined $200 donation to the Task Force Dagger Foundation in your name. The Task Force Dagger Foundation is an organization founded by members of the US Army Special Operations units with the goal to provide volunteer and financial assistance to fellow Special Operations soldiers and their families in times of need as these men and women make the difficult transition from the battlefield to the rest of their lives. 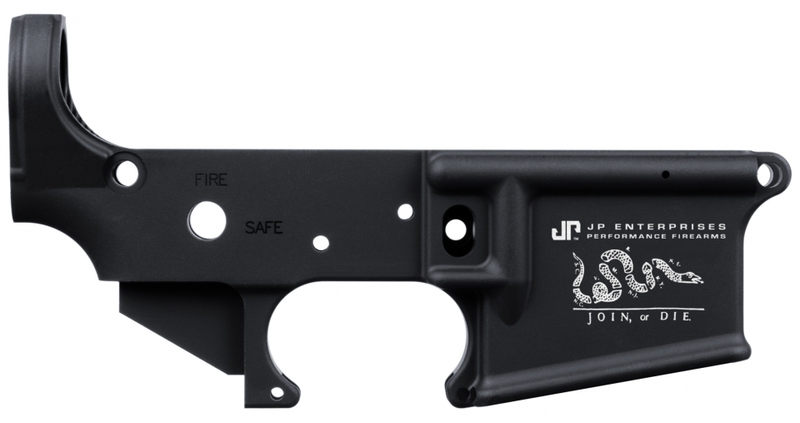 In collaboration with TFD, JP Enterprises is proud to offer a special Task Force Dagger lasermark on any rifle or lower for $100. We will then match this amount for a combined $200 donated to Task Force Dagger Foundation in your name. It's a sharp-looking way to support a worthy cause. What Our Customers Think "Another flawless JP performance." "As a side note your barrel is a piece of art!"